“How long is this playdate exactly?” I asked. “Hmmm.” I was a little concerned about their plan. “Well you’re right, that one is easy,” I said. “But it still takes time.” I thought for a second. “How about banana bread? That’s quick and we have a bunch of bananas that are not looking so hot.” Of course, it’s a total farce that something made with that much sugar and butter is called “bread” and not “cake,” but it was Friday, and why shouldn’t there be a little banana cake lying around over the weekend? Plus, I had the world’s most surefire recipe, which I knew two 12-year-olds could handle without parental supervision. The whole binder system seems so quaint now, in spite of the fact that I only started it about a decade ago. 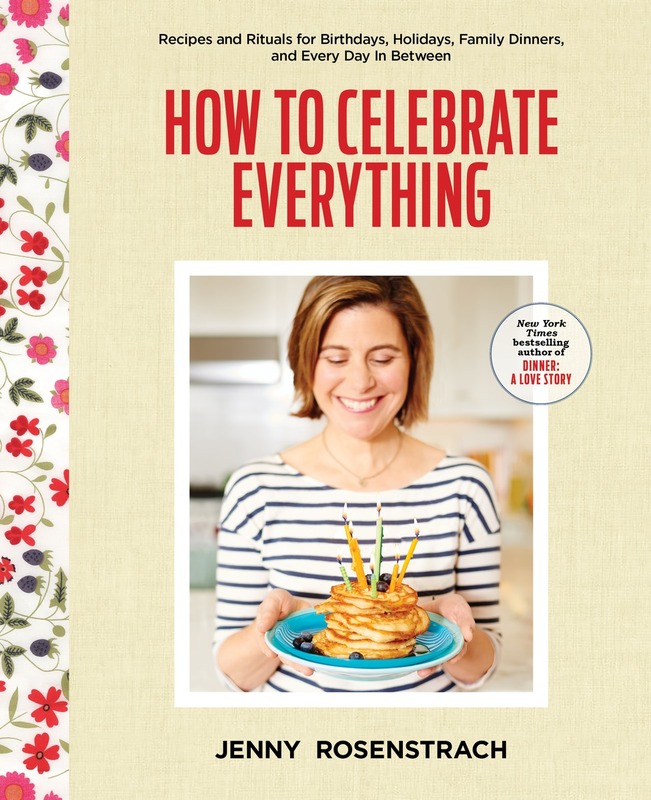 But I still reach for it all the time — even though most of my tried-and-true recipes are digitized on this blog or immortalized in my cookbook. 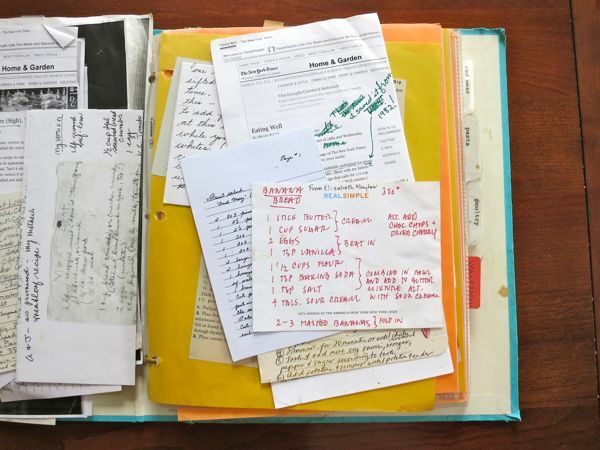 I think that’s because a lot of the recipes in the binder are handwritten…and we all remember the rule about handwritten recipes, right? How they’re the least likely of all recipes to let you down?? The other thing about handwritten recipes? They are way off the Google grid…and how often can you say that in this day and age? I’m not going to rekey the recipe for you like I usually do. Instead, here is a link where you can download a PDF. (Or just drag the above photo to your desktop and print.) Baking time (in a loaf pan) is 50 minutes to an hour, or whenever a knife in the center comes out clean. Let’s see how long we can keep it from Mr. Google. Love the hand written recipe. 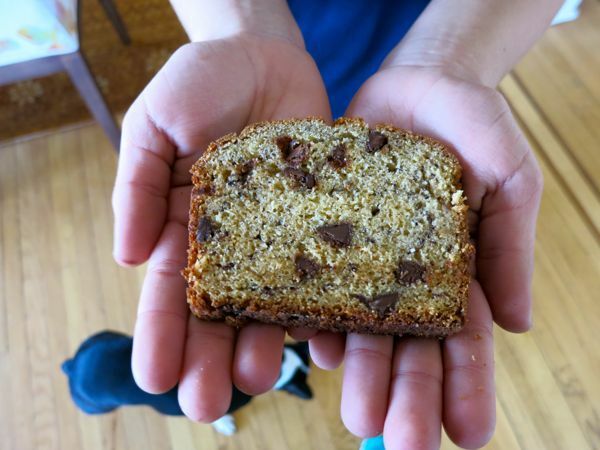 Who doesn’t enjoy banana “bread” with chocolate chips? printed and taking my butter out the fridge RIGHT n0w–but bake for how long? ooo, thanks kim. It’s 50 minutes to an hour or whenever a knife inserted into center comes out clean. I added to instruction above. All fixed. I LOVE the handwritten recipes. I still have mine, too, in binders bought over the years. My husband bugs me to “consolidate” them into a digital file, but it wouldn’t be the same. When I bake each of them, I remember the person who gave it to me, where we lived, what we were doing, and how I got it. Each has it’s own story. Especially the cake from a restaurant owner’s mom (interesting, but long, story! )…in her 80 year old handwriting. I treasure that one almost as much as those in my grandma’s, mama’s, aunt’s, and countless others. So refreshing to see this! Would like to know how long to back it, tho! I’m figuring 45-50 minutes in a loaf pan? 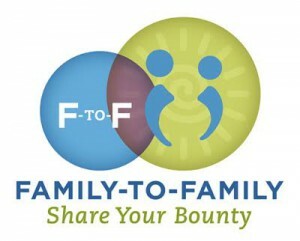 Love the idea of letting kids cook for a playdate. Did you leave them totally alone (including opening the oven, etc.)? If so, how old are the kids? Just wondering. This is even easier for kids to do on their own (and really yummy, too). It is based on the Lorraine’s Banana Bread recipe found on http://suziethefoodie.blogspot.com. In a large bowl, mash 3 ripe bananas with a fork (it doesn’t have to perfect). Then, using only that fork, mix in these ingredients one at a time: 3/4 cups sugar; 4 tbsp. melted butter; 1 whisked egg; 1-1/2 cups flour; 1 tsp. baking soda; and 1/2 salt. Pour into a greased loaf pan (or a 8×8 square cake pan works well, too). Bake at 325 for 1 hour. DONE! No electric appliances are necessary and all you use is a large bowl and a fork. 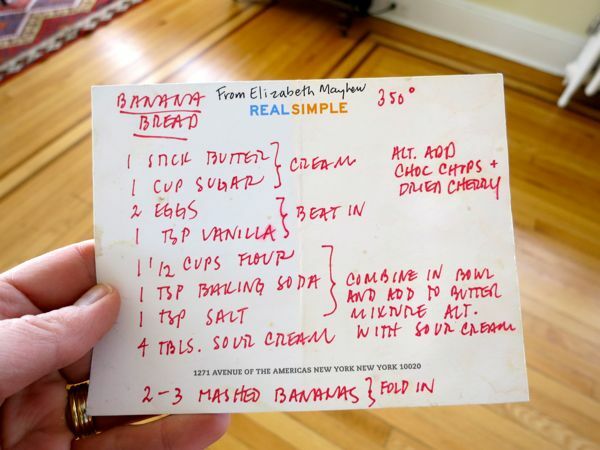 OK, I use the same recipe but it is called “Bill’s Grandmother’s Banana Bread” ’cause I got it from my friend Bill. You can also overcook it until the cows come home and it is still delish! Looks great. I don’t understand the sour cream directions though. Is it an alternative to something else in the recipe or just mixed in at last stage with flour and everything else? Love the recipe format. That’s the way I always wrote my recipes, I still use that format when I copy a recipe. Wish there was a way to do that on a computer. Thanks for a great sounding recipe. You will love that double waffle maker! My 2 little ones gave it to my husband for his birthday last year and it was the best gift he received in years. I can’t tell you how thankful I am that Joanna at Cup of Jo sent us over to your blog. 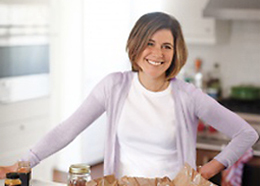 I LOVE your blog and cookbook. Thanks for sharing this one!! Kate – it means add a little sour cream to the butter mixture and then some of the flour mixture and then some of the sour cream until it’s all added together. 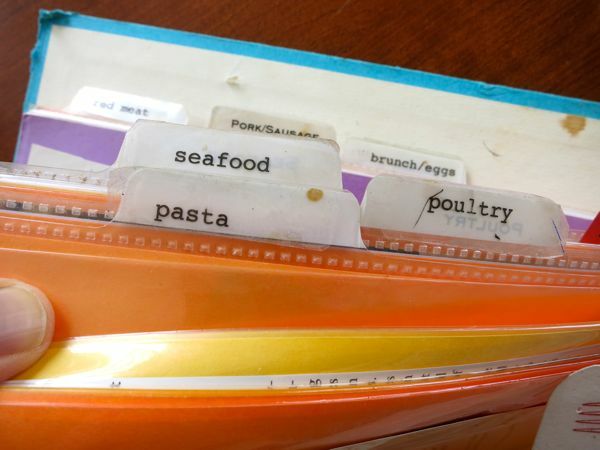 I still use a binder to store recipes that I’ve tried and liked and use over and over. Many of yours are in there! Wow… This looks A.M.A.Z.I.N.G. My MIL makes the most delicious banana bread, my girls love it and they love it for breakfast!! How is this healthy I wonder? But what’s not to love? My MILs tried and true secret is to add bananas that are BLACK. They no longer look good and are BLACK. This is when they are the sweetest! Thanks for the memories – hand written recipes, banana bread and all. Sadly, I had to turn to Mr Google to find out how many grams a US stick of butter is. Around 114 grams?? That dried flowers story is the best thing I’ve read all week. Karen — We’ve definitely used yogurt in place of the sour cream before. Thanks for reminding me to mention that. And just so we’re all clear: 1 stick of butter = 1/2 cup. I LOVE my recipe binder too. Just as much as I love Pinterest. I add recipes to this day. I want try to make banana bread with a chopped up snickers bar. Would that be so wrong? I have a (similar) handwritten recipe in my (similar) binder and have spent the last three years trying to get more bananas into it! It’s practically a vegetable if it has half a dozen bananas, right? Thanks for the clarification. I don’t know why I can’t seem to ever remember that one. I love your recipe binder, looks like a well used, tried and true binder. I have some bananas that have gone very brown and are in need of being baked. I think I found the recipe their going into. Delicious and fail-proof. I used creme fraiche in place of the sour cream, and chopped dark chocolate in place of chips, not because I’m fancy, rather because going to the grocery store with 3 under 3 is avoided at all costs. Thanks for the recipe! you may also check here for health benefits of banana..
oh my gosh, I love Elizabeth.